I watched The Illusionist this week. 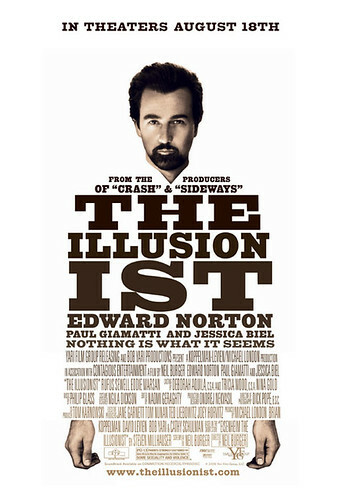 Edward Norton, who plays the lead role as the brooding and deeply in-love illusionist has put in quite a performance. I like how he keeps on doing these interesting roles ever since I first noticed him in American History X. The story is based in Vienna and depicts how Eisenheim (the illusionist) uses his awesome talents to win over a woman who is by far out of his social league. I was hoping that the magic/illusions shown in the movie would be plentiful and interesting. Unfortunately, there are only a handful of tricks shown and everything is all about the twist at the end. Kind of reminded me of The Usual Suspects in that regard – though that is a far more superior flick. The next magic-based movie that I need to watch is The Prestige. Yea, the illusionist was boring. The twist at the end wasn’t even surprising. The movie is about magic for crying out loud! Obviously, he has some trick up his sleeve to save the duchess. I haven’t seen The Prestige but I hear it’s better.